Internet Landscapes is a series of web-based artworks by Evan Roth that allows audiences to experience the Internet’s physical, digital and cultural landscape. Through a series of video works that bring together audio and video recordings charting the artist’s obsession with and journey to find the physical Internet. As part of the Master & Server open call programme he evolves this further with a new commission, Internet Landscapes: Sweden based on the artist’s most recent research and documentation of Sweden’s main Internet submarine fibre optic cable landing locations. These landing locations are transitional moments in which fibre optic cables join the undersea communication network, allowing continents to communicate digitally – send emails, Skype, phone. To view the work online, please visit the Internet Landscapes: Sweden website. 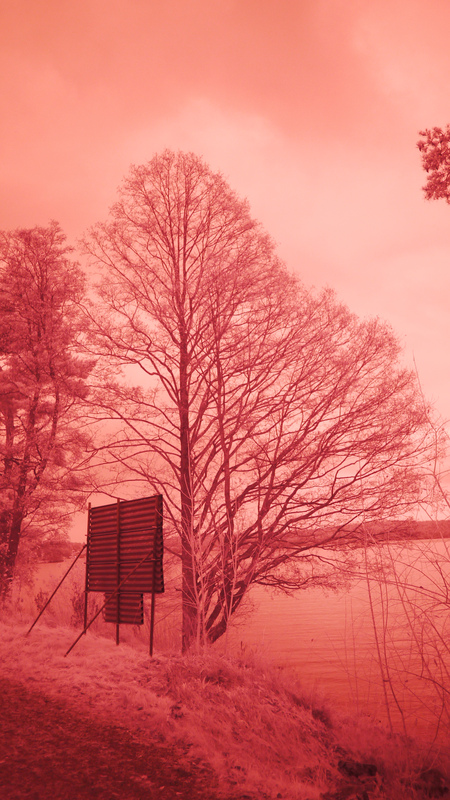 In early 2016 Roth embarked on a pilgrimage to a number of landing locations in Sweden between Kungsbacka, on the south eastern coast, and Väddö, just north of Stockholm, documenting the surroundings using infrared video and binaural audio recordings. The use of infrared is in part a reference to the architecture of the Internet, which uses infrared laser light transmitted through fibre optic cables. While the audio monitors and records his heart rate, surrounding environment and fm radio waves. The result is a online experience that brings together these recordings, to allow you to meditate on the landscape and the internet as the video file transfers through the network from its’ host in Sweden to your screen. For Roth, visiting the Internet physically is an attempt to repair a relationship that has changed dramatically as the Internet becomes more centralised, monetised and a mechanism for global government spying. Clearly seeing the infrastructure disappear underground and underwater also alludes to the slowly eroding optimistic and egalitarian values many of us attributed to earlier incarnations of the internet. Through understanding and experiencing the Internet’s physicality, one comes to understand the network not as a mythical cloud, but as a human made and controlled system of wires and computers. Evan Roth is an American artist based in Paris whose practice visualizes and archives culture through unintended uses of technologies. Creating prints, sculptures, videos and websites, his work explores the relationship between misuse and empowerment and the effect that philosophies from hacker communities can have when applied to digital and non-digital systems. His work is in the public collections of the Museum of Modern Art, New York, and the Israel Museum, and has been exhibited at the Centre Pompidou, the Kunsthalle Wien and the Tate. He co-founded the arts organizations Graffiti Research Lab and the Free Art & Technology Lab. Roth was born in Okemos, MI in 1978. He earned a BS in Architecture from the University of Maryland and an MFA from the Design and Technology department at Parsons. Awards in recognition of his work include the Golden Nica from Prix Ars Electronica, Rhizome/The New Museum commissions and the Smithsonian’s Cooper-Hewitt National Design Award. This new commission was developed with the Masters & Servers partners as part of an open call in 2015 and will launch in March 2016 alongside the exhibition Black Chamber at the ŠKUC Gallery n Slovenia, Curated by: Bani Brusadin (IT/ES), Eva & Franco Mattes (IT/US).